Learn More About Wiley Mission in this Video! Wiley Mission has had a unique beginning. It is an outgrowth of a ministry that began during the depression years of the early 1930's. At that crucial time there was dire need in the city of Camden. There was no work, no money, and in many instances whole families were deprived of the bare necessities of life. Rev. John S. Hackett was appointed as Pastor of the Wiley Methodist Episcopal Church in March of 1927. Therefore, he found himself concerned not only with the spiritual needs of his congregation, but greatly involved in the many needs of the community who at that time were suffering with deprivation. He and his small congregation began to deal with those problems. The first program set up a breakfast for school children. This advanced into a feeding program for whole families which included an evening meal. 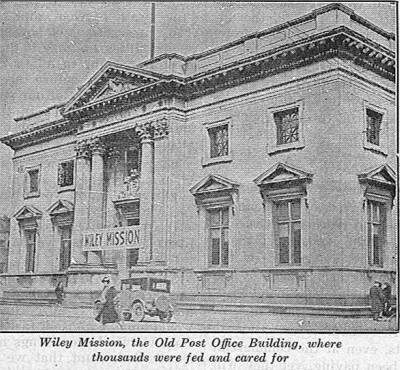 By 1934 Wiley was caring for as many as four hundred men per day in the Old Post Office Building in Camden. In 1935, a lady came to Rev. Hackett and told him that the Lord had impressed her that a ministry to the aging should be included in the ministry of Wiley Mission. With the help of a faithful congregation, he proceeded to set up this plan. Mother Johnson became the first resident and was the inspiration for this work in its care for the weak and infirm. On April 19, 1939 the outreach to the needy had grown to such proportions that it was necessary to incorporate the Wiley Mission. It was granted a charter on that date under the church act of the State of New Jersey. In 1940 Wiley began to dedicate all of its efforts in health care to those in sunset years. A permanent location was established here in Marlton, New Jersey. Woven throughout this ministry is a philosophy of care that has never been lost over the years. When the founders of this work looked out of the parsonage window one day and saw two little children salvaging their breakfast out of a garbage can, Pastor Hackett said, "We will hit that thing!" This ministry has worked diligently and sincerely to alleviate the distress of poverty, the crippling of disease, and the weakness of the aging and infirm ever since. As the ministry grew, Wiley developed a vibrant worshipping community for all ages in the greater Marlton area. Today, Wiley Church endeavors to create an atmosphere of loving discipleship where children, youth and adults are challenged, nurtured and guided to live their faith in daily life. Wiley Mission continues to dedicate itself to this philosophy of care. It is Wiley's intention to be a Christ-centered ministry, ministering to all. Some will have differing needs. Their background and economical standings will be different as well. Many will indicate certain spiritual desires, but to all there will be a ministry of redemptive love that will exalt and glorify the Lord Jesus and make Him known to every person.